Cheese and marmalade savoury biscuits, recipe from LandScape magazine Jan/Feb 2018 issue. In a large mixing bowl, combine the butter and flour thoroughly using the back of a wooden spoon. Add the grated cheese and mix in. Grease a large, flat oven tray and roll 1 rounded tsp of the mixture into a ball. Press down onto the tray to make a biscuit shape, then repeat until all the mixture is used up, spacing them out to allow for spreading. Leave to chill for 30 mins. Preheat the oven to 190°C/gas mark 5. 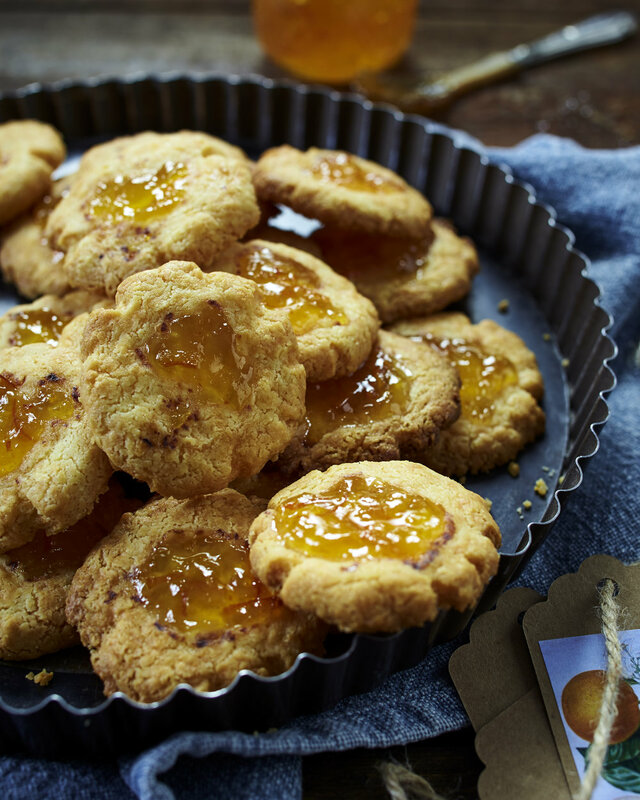 Top each biscuit with 1 tsp of marmalade, then bake for 15-17 mins until golden and crisp. Allow to cool slightly before placing on a wire rack to cool completely, then serve.